Issue XIV Vol. 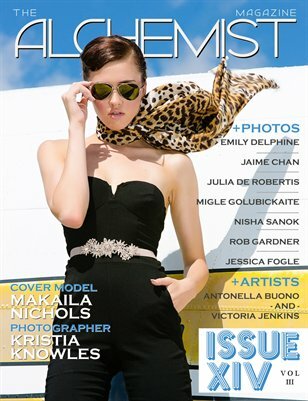 III of The Alchemist Magazine features model Makaila Nichols on the cover photographed by Kristia Knowles. The issue also features photography editorials by: Emily Delphine, Jaime Chan, Julia De Robertis, Migle Golubickaite, Nisha Sanok, Rob Gardner and Jessica L. Fogle. Featured Artists: Antonella Buono and Victoria Jenkins.